Welcome to all my new followers. I just noticed I am at 299 followers. So close to 300 :) It seems so monumental. I may have to figure out some kind of fun giveaway when it tips over 300. Thanks to all of my followers that read and comment on my blog, I love the feedback and have loved getting to know so many of you. You are all awesome! I finally picked up some new headphones to run in. I saw them at Costco yesterday and since they had a huge manufacturers rebate I caved and got them. I had thought to wait until after Christmas to get new ones since the left earbud was still working on my old ones. They were 2 pairs for 19.99. I couldn't resist! Two for basically the price of one! I had my ipod in the car so as soon as I got in I hooked myself up to test out the new ones and I would have to say I am more than pleased! I am going to give them the real test later and take them for a run. I read some reviews on them this morning and found them a little mixed, but at this point they are better than nothing! I feel like my eating has been really crappy this week, hardly any fruits and veggies and not of carbs and candy. Ooops. I think it is the cold weather, I want comfort food! I am determined to eat better starting today! I loaded up on fruits and veggies at Costco last night. So far so good. I ignored the cookies and had oatmeal for breakfast. Wondering if it would help to keep a food log? Any thoughts here? I don't want to be obsessed just healthier! Saw this on Pinterest too thought it was interesting and wanted to share! Will make me think twice next time I think I want to order fries! Good luck to everyone running races this weekend. Don't forget to enter my Gelbot giveaway if you haven't already! Tell me your favorite fruit and veggie. I am the same way about eating. Sometimes I do great, other times not so good. Do you do bountiful baskets? I think they have them in Billings. You get a lot of fruit and veggies for just $15. It is such a great deal and you get lots of different and really good produce. It has made me eat better when I get a basket! great price for the headphones! I love it when I find a deal! I'm trying to do better with fruits and veggies too - so hard in the winter when all I want is comfort foods! I hate it when I'm at a 99 follower number...cuz I hate odd numbers - especially 9s! Here's to you hitting 300! I never have trouble getting in more than enough freggies but I need to cut way back on the candy and empty carby calories too. I am off to walk to town and stock up on some oats and apples. I love squash in the winter - and I chop spinach leaves on or in everything! Congrats on 299! Three hundred is so close! Thank you for sharing that calorie thing. It's too easy to just worry about how many calories and not the quality. Love, love, love watermelon and mangos! Yummmm! I wish I could figure out how to get more traffic on my site! 300 is monumental. I have often wondered if a Costco membership is worth it; how much do you use yours? Congrats on your blog milestone! I see you've already hit 300 now - congrats! 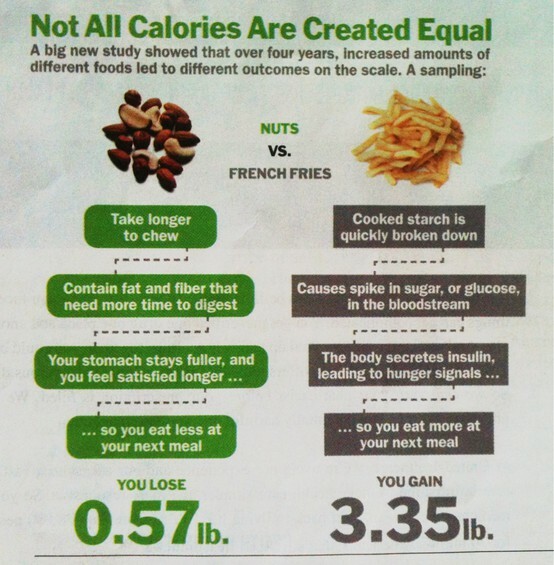 That last photo is really interesting, so true that what you eat is more important than calories! Favourite fruits and veggies would have to be strawberries and sweet potatoes. I started keeping a food journal back in August, and I find it really helps you identify where your problem areas and triggers are. It becomes second nature not long after you start so it doesn't feel like a chore to do. Give it a shot! Totally a strawberry guy myself! Favorite veggie would have to be bell peppers...the only reason being is the smell of a pepper field in early morning is propobly the single most amazing smell in the world...one of the few fond memories I have working on a farm! My current faves are sweet potatoes (microwaved and sprinkled with cinnamon, brown sugar and nuts) and apples (add cut-up apples to oatmeal). Yay for 299! I am totally entering the gelbot giveaway as soon as I am done yammering about this post! I hate that I either eat perfectly or perfectly crappy. This week was more the latter. Good job stocking up on fruits and veggies. Favorite fruit? Pomegranate! So yummy. Veggie? Hmmm Asparagus roasted in the oven or on the grill. Heavely! I also love yellow cauliflower but I can't find it too often. You deserve all of those followers (and I see now you have 301 :^) )! You are positive and informative, good for all of us. Congrats on a big milestone! 300 is pretty amazing! I think the food log is a good idea especially this time of the year. I'd like to know more about the headphones. I'm in the market for new ones but I really hate trying new ones out. Yay on 299/300! Those stats really put things into perspective. I like bananas because they are good for on the go. I also like the sweetness of kiwi but it takes more prep time. I am starving now after looking at the pictures and it is almost midnight. Not good! LOL!